That’s Greek for “blank slate” for those of you who don’t know. Well it’s been a pretty exciting few days off. 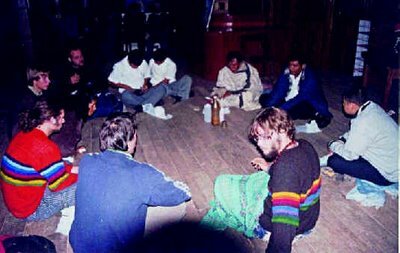 After all the chanting and meditation in Oregon I happened to hook up with Sting who had this great idea to fly down to this lodge in the rainforest on the Madre de Dios river in Peru and spend two days tripping on ayahuasca. I’m like, Dude, say no more, fire up the Apple jet and let’s go, and if I come up with any product ideas I can write if off my taxes as work-related. (That’s me in the white T-shirt in the photo. Sting is just to my right, barely visible in back.) Well, ayahuasca is pretty intense stuff. The experience lasts ten to twelve hours and is kind of a mixture of dreaming and dying. Side effects include vomiting and diarrhea, so you have to wear Depends and keep a bucket beside your mat. Luckily we had a great spirit guide, Diego, who played a flute and kept us centered. And sure enough this really opened me up to some new ideas, including this notion that the entire world is going to end in the year 2012 when the Mayan calendar runs out of days or something. But also I did some thinking about the iPhone. I spent all this time thinking about what people do with a phone and sometime during my second trip, as I was spooning with Sting and listening to his sobs, I realized, Man, what phones are all about is communication. Connecting with another person. That is the pure essence of the phone, once you strip away all the other stuff, which really is just clutter. At Apple we’ve spent years hacking away putting all these features into a phone when all people want to do is make phone calls. Not listen to music. Not browse Web pages. Just talk. They want to talk to one another. That’s it. Sounds obvious. And it is obvious, if you’re open to it. If you’re listening. So as soon as I got back to the Jobs Pod I sent out an email to the iPhone team: We’re back to square one. Starting over. Tabula rasa. Throwing out everything we’ve done so far and making a new phone that just makes phone calls. Small, white, gorgeous, as few buttons as possible. Our designers tell me we need at least 12 buttons so we can have all the numbers plus * and # symbols. I’m telling them to go back and do it over. I want one button. No more, no less. One. Like the Bono song, which we will totally use to promote the phone. The designers keep looking at me like I’m crazy. But I’ve never been saner in my entire life. We will do this. And it will be huge. Best of all, turns out that if all you want to do is make phone calls you can buy this super-cheap telephony chip set from China for like 50 cents a phone. Then we sell them for 800 bucks cause they have an Apple logo. Sweet, right? “The 1-Phone.” Or: “The One.” Or something. We’ll do commercials showing people in colorful silhouettes, dancing around talking on their super-expensive white phones. Or maybe we’ll hire that fat PC dork and have him use a regular phone and then a cool guy use an Apple phone. Re: the hiatus, thanks to all of you for being so patient (even you, Luis Ordena Pizarro Clemento Morena Pimentar del Perro y Gato y Pato y Mamon, you dickbag.) Every once in a while El Jobso just needs to go off into the rainforest and think big thoughts. Man I totally loved Peru but it is sooo good to be back and able to get a decent shower again. And to not be puking into a bucket and crapping my pants. Namaste. Peace out. » Borg steals credit for my work. Again.